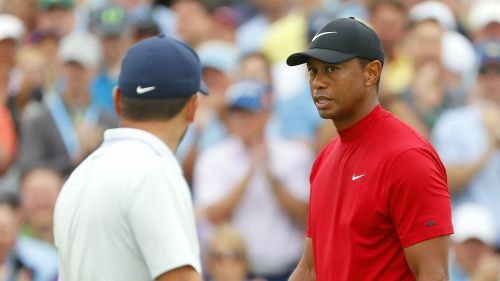 Tiger Woods' hopes of winning a fifth Masters title were dramatically enhanced as he found himself in a share of the lead when playing partner Francesco Molinari found water at the par-three 12th. Molinari held a two-shot lead over Woods at the top of the leaderboard as they arrived on the 12th tee on Sunday. However, the Italian made a mess of his tee shot, failing to clear the water guarding the green, and ended up making a double-bogey five. Woods - seeking a fifth green jacket 14 years after he claimed his fourth - played it safe after Molinari's error, finding the left side of the putting surface and two-putting for par. Tony Finau, Brooks Koepka and Ian Poulter also put balls into Rae's Creek to dent their chances, but Xander Schauffele joined Woods and Molinari at 11 under by birdieing the 13th. Two-time Masters winner Bubba Watson, Jason Day, Patrick Cantlay and Jon Rahm were suddenly only off the pace. Two of the next three holes for the final group were par fives, raising the possibility of more dramatic leaderboard movement as the tournament neared a conclusion, particularly with rain now falling at a windy Augusta. Sunday's action began much earlier than usual, with tee times having been brought forward and players grouped in threesomes due to the anticipated arrival of thunderstorms in the afternoon.